The World Cup football always concepts as a great tournament. Every season it gives opportunity to see and learn lots of new season. The most interesting thing is that it often held the game among those team who does not meet normally. Saudi Arabia vs Egypt match is the such kind of game. The A group member going to meet in 25th June, Monday. The time set for the match is 15:00 at the local time. Volgograd Arena will host the match. It is a World Class stadium which having above 45,000 seating capacity. Both side are hoping to grab the match and so that they very excited about the match. However the two nation faced 8 times in previous and the SA able to win just one game. Where Egypt won 6 and 1 match finished with draw. This is the last match of two side which will be covered by a various TV channel in the world. Give a look in the following game details. DEFENDERS : Mohammed Jahfali (Al Hilal, Mansoor Al-Harbi (Al-Ahli), Mohammed Al-Breik (Al Hilal), Saeed Al-Mowalad (Al-Ahli), Yasser Al-Shahrani (Al Hilal), Motaz Hawsawi (Al-Ahli), Osama Hawsawi (Al Hilal), Omar Hawsawi (Al Nassr),), Ali Al-Bulaihi (Al Hilal). MIDFIELDERS: Abdullah Al-Khaibari (Al Shabab), Houssain Al-Mogahwi (Al Ahli), Salman Al-Faraj (Al Hilal), Salem Al-Dawsari (Villarreal Nawaf Al-Abed (Al Hilal), Abdulmalek Al-Khaibri (Al Hilal), Abdullah Otayf (Al Hilal), Taiseer Al-Jassim (Al Ahli), Mohamed Kanno (Al Hilal), Hattan Bahebri (Al Shabab), Mohammed Al-Kwikbi (El Ettifaq),), Yehya Al-Shehri (Al Nassr). FORWARDS: Fahad Al-Muwallad (Levante), Muhannad Assiri (Al Ahli), Mohammad Al-Sahlawi (Al Nassr). GOALKEEPERS: Mohamed El-Shennawy (Al Ahly), Sherif Ekramy (Al Ahly), Essam El-Hadary (Al Taawoun), Mohamed Awad (Ismaily). DEFENDERS : Ahmed Fathi (Al Ahly), Saad Samir (Al Ahly), Ahmed El Mohamady (Aston Villa), Karim Hafez (RC Lens), Mohamed Abdel Shafy (Al Fath), Omar Gaber (LAFC), Ayman Ashraf (Al Ahly), Mahmoud Hamdy “El Wensh” (Zamalek), Ahmed Hegazi (West Brom), Ali Gabr (West Brom), Amro Tarek (Orlando City). MIDFIELDERS: Abdallah El-Said (KuPS), Tarek Hamed (Zamalek), Sam Morsy (Wigan), Mohamed ElNeny (Arsenal), Mahmoud “Kahraba” (Ittihad), Ramadan Sobhi (Stoke City), Mahmoud Abdel Aziz (Zamalek), Shikabala (Al Raed), Mahmoud “Trezeguet” (Kasimpasa), Amr Warda (Atromitos). FORWARDS: Mohamed Salah (Liverpool), Marwan Mohsen (Al Ahly), Ahmed Gomaa (Al Masry) Ahmed Hassan “Koka” (SC Braga). 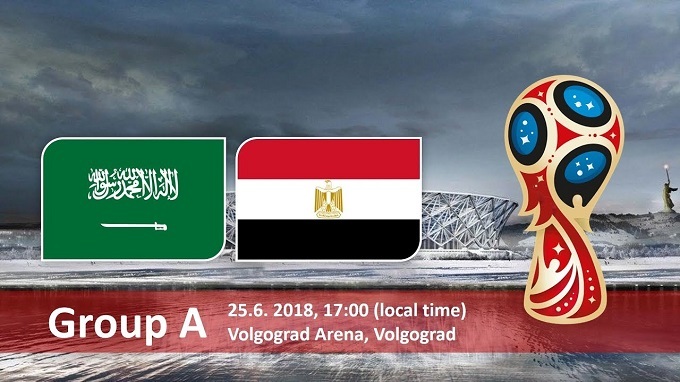 When it’s about Saudi Arabia vs Egypt prediction, it can be said that the both team is not favorite of the tournament, even they have not the ability to cross the group stage. Im their football history they could not go to the next level. However the match have the possibility to go Egypt favor, as they have the good record against SA. The team holding a strong squad. They have some talent guys who plays in the Champions League and English Premier League. And the most talented Mohamed Salah who nominated for the Ballon d’Or award. Saudi Arabia have no chance as they they never won a single game in the WC championship. So watch the game and enjoy the tournament with us.